Tania Mouraud was born in 1942 in Paris. 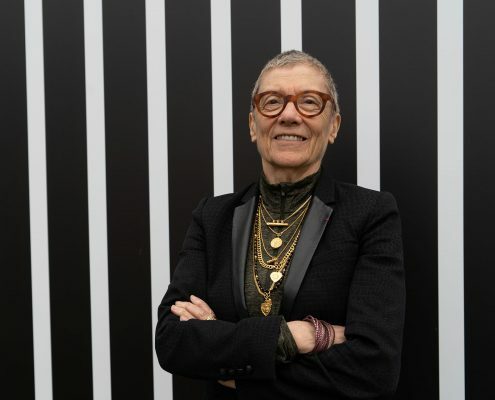 Ever since the end of the sixties, Tania Mouraud’s work has consistently examined the relationship between art and social ties through various mediums: painting, installations, photography, sound, video, performance, etc. She proposed adding a meditation room to our standard apartments (1968). Using a public display of 3 x 4 meter panels, she expressed her disapproval with a society that glorifies possessions at the expense of the human dimension (1977). She reflected on the decorative relationship between art and war and on the limits of perception with the help of writing by creating “mots de forme” (1989). From 1998 onwards, she has brought photography, video and sound into the world of painting to query various aspects of history and life. Since 1989, Tania Mouraud has been painting murals while experimenting with the plasticity of writing on an architectural scale. Perfectly proportioned black letters and white spaces test the limits of readability. Paradoxically, it is the monumental dimension of the writing that makes it difficult to read and turns it into an abstract composition. 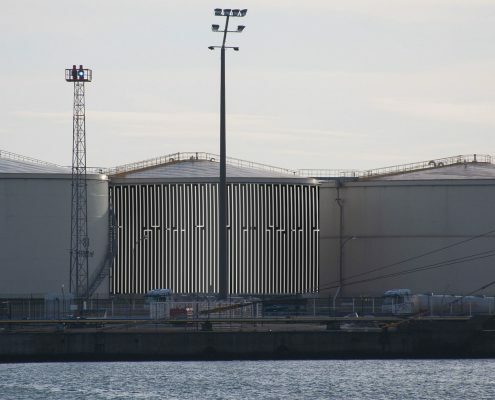 On the occasion of the GIGANTISME — ART & INDUSTRIE triennal, Rubis Mécénat cultural fund, in association with the Frac Grand Large – Hauts-de-France, is commissioning French artist Tania Mouraud to produce three original monumental works to be installed at the Rubis Terminal site in the Port of Dunkirk and on a city-centre façade. Ses os se sont changés en corail. Perles sont devenus ses yeux. Of his bones are coral made. Those are pearls that were his eyes. Un endroit pour rêver dans chaque ville, espace-éternité. The fact that it is so hard to read turns this gigantic text into an abstract, geometric decor that highlights the architecture. Discovering the text in the course of strolls brings walkers back to their own dreams of the absolute while alleviating the loneliness that is inherent to urban life.